Darjeeling/Kolkata: The upper reaches of Darjeeling experienced the first snow of this winter, while different parts of the Darjeeling Hills witnessed light drizzle. With the mercury plummeting steadily, the Queen of the Hills ushered in the winter chill. Sandakphu, the highest point of Bengal sitting at an elevation of 3,636 m, experienced the first snow of this winter. "It snowed from Tumling (2,970 m) to Sandakphu on Friday. 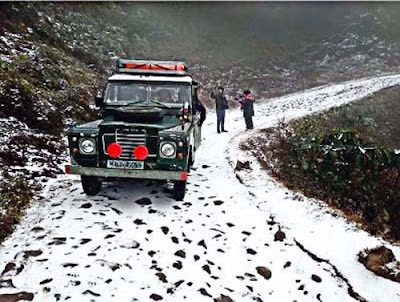 However, it was very light and for a short duration," stated Anil Tamang of the Singhalila Land Rover Association. Temperature, meanwhile, has dipped to below 0 degrees in Sandakphu. There was hail and sleet from Sukhiapokhari to Maneybhanjyang and in the surrounding areas. "Snowfall brings in tourists. Darjeeling is fast becoming a winter destination as well. This will definitely boost the economy of this region," stated Abesh Bhattacharjee, a hotelier. After a spell of blue skies for the past few days, the temperature plummeted steadily in Darjeeling town also. Day temperature dipped to 6 degrees, with a further fall after sundown. Overcast skies were accompanied with a light drizzle. Roadside fires were lit to escape the biting cold. Shops selling woolens and winterwear did brisk business, but downed shutters early. "On Thursday, there was an upper air trough from east Bihar to Gangetic Bengal, causing western disturbances. There is an upper air cyclonic circulation over sub-Himalayan Bengal, which is bringing in rain to the lower reaches and snow in the upper reaches of Sikkim and Bengal. Similar weather conditions will prevail in the next 24 hours," stated Gopi Nath Raha of the Met Department, Gangtok, Sikkim. Meanwhile, the Air Quality Index (AQI) in densely populated North Kolkata was found to be 'severe' on Friday, but the West Bengal Pollution Control Board (WBPCB) said it was due to present weather situations in this time of the year. The AQI at WBPCB's air monitoring station at Rabindra Bharati University, the only computerised monitoring station of North Kolkata, was 434 PM 2.5 at 1 pm, which is 'severe' in air monitoring terms. The AQI is an indicator of air pollution caused by three pollutants: NO2, PM 10 and PM 2.5. The index indicates air quality as 'good' for values of 0-100, 'moderate' for 101-200 and 'poor' for 201-300. Even after Diwali, the PM 2.5 count was 330 at the Rabindra Bharati air monitoring station. The AQI reading at US Consulate's air monitoring station in South Kolkata read 196 PM 2.5 at 5 pm during the day, being marked as 'unhealthy'. While environmentalists described the situation as alarming, WBPCB chairman Kalyan Rudra said the reading at Rabindra Bharati cannot be representative of the entire city. "Besides, there are factors like the overcast sky and flow of north-easterly wind from areas like Jharkhand into the city which don't allow suspended particulate matters to move upwards," Rudra said.